Frankfort’s salmon fishing has been hit or miss lately for most of the charter boats. Salmon have shown up in waves, and when they do, they have been incredibly snappy, with lots of happy customers and anglers alike. Meat rigs and spoons are the keys to getting salmon to go, and first light and last light have been the hottest times to be on the water. Anglers arriving after first light have often missed the best salmon bite. Kings continue to dominate the salmon catches, but a few coho are being caught as well. By far, the most consistent fishing has been the lake trout fishing, with lots of big fish coming boat-side. And with a diet consisting more and more of gobies, the lake trout meat is a beautiful orange hue, very closely resembling that of salmon. Lakers are being taken both close to bottom and suspended. Anglers targeting “the bank” have done well when the salmon are around, but many are making the run to fish west Platte Bay to specifically target the lakers. Leland’s fishing has been an up and down roller coaster much like Frankfort’s. When the pockets of king salmon have come through, the fishing has been stellar. The recent few days of hot steamy weather has shut things down salmon-wise a bit more than anglers would prefer, after several days of hot fishing. Lake trout fishing has been curiously inconsistent as well, but what fish are being caught have been dandies. Fishing tight to bottom has been the most productive, but targeting suspending fish has also scored fish throughout the day. West Bay in Traverse City has been mostly consistent the past several days. The hot weather the past few days has pushed the fish deeper, but the salmon are still staged around the “hole” near the mouth of the Boardman River. Trollers have done well when hitting the first light of day. Lake trout fishing remains awesome, fishing suspended fish in about 80 feet of water. Not only are fish seemingly plentiful, they are running fairly large, too. East Bay salmon fishing has been consistent lately, but not fast and furious. Charter boats are getting anywhere from 2-5 fish a trip, but are hoping for better numbers of king salmon to move into the system in the upcoming days. 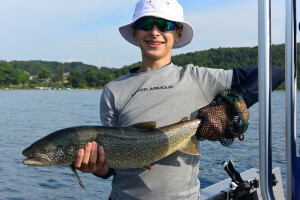 Lake trout fishing remains red hot, with lots of big fish coming to the boat. Targeting suspended fish is the key, and 80 feet down seems to be the best depth right now. As always, when fishing for king salmon, the hottest bite is either the first light of day or dusk right before last light in the evening. Platte Bay is still fishing reasonably well for lake trout. There are lots of smaller sub-legal fish in the system, which means that when these schools are found, it can be nonstop action. Even the smaller 16-18 inch trout pound an ounce and a half jig incredibly hard. For targeting larger keeper-size fish, the deeper breaks have been the ticket. Coho salmon are starting to show, just not in great numbers yet. The forecast has some north wind for the next couple of days, and that may be all that’s needed to bring in more of these awesome fish where we can target them with jigging techniques before they get up shallow in their staging area just outside the mouth of the Platte River. Fishing in the Sleeping Bear Dunes National Lakeshore is a special opportunity, and with such a wonderful backdrop of the Dunes and the Manitou Islands, who couldn’t help but love to fish out on Platte Bay? Jigging for lake trout has been great the past couple of weeks. Fish are mostly deep now that summer is finally here in earnest. The past few days of hot weather has really made it pleasant to be out on the water. Lakers have been scattered depth-wise, but the best jigging bite has been in 105-120 feet of water. Use 1-2 ounce jigs to target lakers that deep. Salmon are starting to show up in the “hole” near the mouth of the Boardman River, meaning that jigging action for king salmon should be heating up soon. Jigging spoons up to 3 ounces are the keys to getting bit by the big king salmon that roam these waters. Jigging for East Bay for lake trout has been stellar lately. Of course, not every day can be a banner day, but the action has been great overall. Not only are numbers of fish coming to the boat, but the average size has been tremendous as well, with quite a few fish in the 6-8 pound range. The best bite for our trips has been in 105 plus feet of water. Early in the day, we have been able to get good numbers of fish in as shallow as 80 feet as well. As the day progresses, we have moved deeper, as the trout have moved to deeper water as well. We have even been able to target suspending fish by either dropping our ounce and a half size jigs down to them, or reeling up quickly through the water column, triggering aggressive bites from the suspending fish. There’s nothing quite like reeling up from the bottom quickly only to watch the rod double over as an aggressive lake trout grabs the jig as it comes by! Whitefish have also been caught on occasion, adjacent to the lakers, in 100 plus feet. King salmon are starting to show up on the Big Manistee River, and angling pressure is increasing as well. Although there aren’t big numbers just yet, the recent rain should pull more fish into the rivers, and the north winds predicted for the next couple of days, although not predicted to be high, should bring some more fish into the staging areas of Manistee Lake. Trout fishing remains excellent, despite the late August date! Small spinners have produced well on recent guide trips, and 50 fish days are still possible. Although most of the fish are small 10-12 inches, they are scrappy and a lot of fun to catch. Larger fish in the 16-18 inch range are also being caught, mixed in with the smaller ones. Bass fishing on the Manistee has been tougher lately. Soft plastic jerkbaits have been the ticket for the smallies in the river the past few days, as have been weighted flies resembling minnows. King salmon have started to run the river, and what fish are in the river are mostly above the Homestead dam. The heavy rains yesterday should bring more fish into the low portion of the Betsie, below the dam. The fish are bright chrome and feisty, so beefing up on leader material is a good idea. Early salmon will absolutely chase a streamer when presented well, and watching a bright chrome king salmon chase a fly in shallow waters like the Betsie is tough to beat! Some of the best stretches are reached by boat, but then can be waded easily. There haven’t been any cohos that have run up the Platte to speak of, but there are still walleyes in Loon Lake, in the Sleeping Bear Dunes National Lakeshore. With the summery weather the past few days, tubing and kayaking action on the Platte has picked up, so anglers should be watchful for tubes, kayaks and canoes. Labor Day weekend will be busy if the weather is nice, so it may be best for anglers to go early in the day if they plan on getting out before the crowds. Smallies are mostly deep these days, as the summer pattern is here in earnest. Drop shot rigs are the top producers when fishing this deep, and baits resembling gobies are working the best. Deep water here means fishing down in 30 plus feet of water. Windy weather helps to get fish active up shallower, and lures like spinnerbaits can work well when the wind is howling. The past several days have been hot, and while there has been some breeze, it has not been windy enough to really even try to target shallow fish. The deeper fish have been scrappy and fun to catch for guide trip customers. While the average size is a respectable pound and a half or so, there have been a reasonable number of fish in the 3-4+ pound range to make for extremely happy clients, despite the fact that it is late August. Most of the inland lakes are fishing tougher than we would like. Lots of weeds makes fishing tougher still, as lure choice plays a role in that baits must get down through the weeds to the deeper waters where the bass roam in the summer. Early mornings can still be topwater time, fishing over the weed edges. Points, inside turns and humps adjacent to deep water are the keys to success on the inland lakes, and don’t be surprised when a pike or two lashes out at bass baits ripped through the weeds. Catching Steelhead 10-15 miles off shore. Summer Steelhead on the big lake are typically caught in the top part of the water column. When they are hooked, these fish put on a spectacular aerial show. The salmon fishing is starting to pick up along the bank at first light with fish running 40-70 feet down. As the salmon bite slows in the morning, big lake trout are being caught off of West Platte Bay. Salmon catches out of Leland have been spotty lately. A couple of recent hard north winds have brought in a few more fish. The lake trout fishing remains constant with the best actions being around 100 feet. Lake trout fishing remains hot most days, with a couple of salmon bites per trip. 60-80 feet has seen the most consistent action, but dropping down to 100-120 feet has also produced good results, especially in the afternoons. Lake trout fishing has been exceptional all season, and still remains outstanding. Most of the fish have been coming from 60-90 feet of water, close to the bottom. First light has seen some salmon bites the past few trips, and hopefully salmon action will continue to pick up as August rolls in. Jigging has been very good lately, with many bites per outing. Larger jigging spoons have produced better recently, with most bites coming from 70-85 feet of water. Depending upon the current in the bays, fish have been caught as shallow as 50 feet, and as deep as 125 feet. Lots of fish right around the 20" minimum are coming boat-side, as well as plenty of fish above the 25" slot limit, providing steady action. Anglers are allowed to keep 1 fish over 25" on the Bays, and we have seen quite a few fish over 10 pounds. Anglers may have to hunt around a bit to find the bigger fish but the time can be well worth it when the bigger fish are found in 65-85 feet of water. Lake trout jigging has been mostly good, with some very big trout being caught when they can be located. Fish here are a little more subject to fluctuating water temperatures, as Platte Bay is on the main portion of Lake Michigan, just north of Frankfort. When the lake trout are active and happy, they can be targeted in 65-85 feet of water. Jigging down to 100 or even 120 feet can produce when the fish get a little pickier. Jigging spoons in a variety of colors and sizes have all worked well as of late. The river temperature is still approx. 67 degrees. Trout at the Tippy Dam can still be taken on fly and gear presentations. Small streamers will do best for fly anglers preferring to fish during the middle of the day, while caddis flies are showing in the early evenings, providing great action on dry flies. Small mouth bass remain active in the river, readily chasing soft plastics and weighted flies like clousers. Summer steelhead are also showing themselves, with impressive aerial displays and runs when hooked. Mousing has been very productive at night with savage strikes in key stretches. Tricos are going strong in early mornings. Browns have been active. Fishing for browns has been good, followed by blue winged olives aka BWOs. The streamer bite was good on the Boardman River several days ago, with the best action picking up after dusk. There is some late hex activity on the upper Manistee, below 612 providing fly anglers a last few attempts at fishing the big mayfly patterns. Terrestrials are starting to play a role as well. Fishing on GT Bays remains very good, even as fish are transitioning to deep water for summer. Drop shot rigs continue to be a key presentation as the fish drop into their deep water patterns. When there is wind, the fish may come shallow, providing anglers with a nice shallow-water bite. Shallow is a relative term here on the Bays, meaning water ranging from 4 feet to 14 feet or so. Spinnerbaits work well when it’s windy, and finesse presentations when it’s calm. Natural colors tend to work best in the super-clear waters of the bays, but there are times when a bright color can provoke a reaction strike from aggressive smallmouth bass. Bass fishing on the inland lakes, whether it is for largemouth or smallmouth, is always a bit slower during the summer. Deep weed edges are the ticket to finding summertime bass here in northern Michigan. Presentations like bladed jigs work well for largemouths, while double willow spinnerbaits work better for smallies when it’s windy. Dropshot rigs or jigs presented adjacent to the weed edge or ripped through the weeds can lead to some thunderous strikes. While summer bass fishing on the inland lakes can be tougher, big fish can still be caught, as evidenced by a 6.56 pound smallie caught on Lake Leelanau a couple of days ago.